Trying something new again. I don’t remember how I found out about this particular brand of shiritaki noodles, nor how I started getting weekly emails from them. But, when I got an email about a trial/tester pack, I figured I might as well test them out. 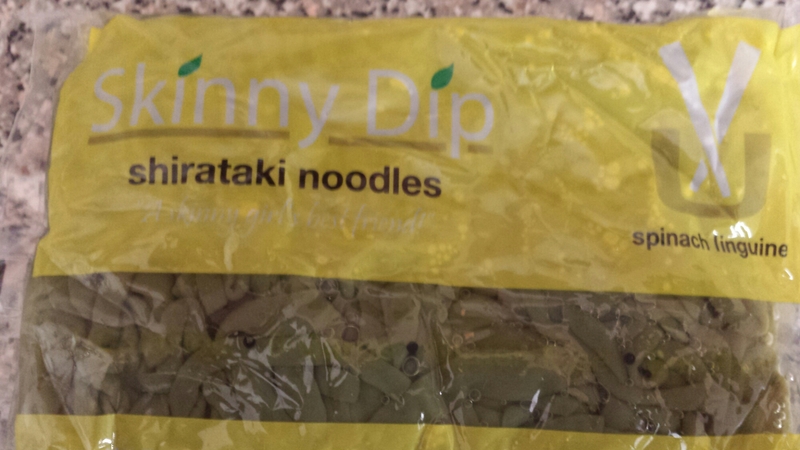 The brand is Skinny Dip Noodles. It’s called the 1x Variety Pak Sample and cost $23.95. In the ‘pak’ you get one bag each of Angel Hair (I see a stir fry in my future), Fettuccine (chicken and broccoli Alfredo), Rice, Lasagna, and Spinach Linguine. They come in a compact brown box from a Weight Loss Media company. Bonus, the mail carrier is too lazy to bring things up to my apartment, so these stayed at the post office for a couple days. Still good to go when I picked them up. Today I tried the spinach linguini. Don’t be put off by the liquid they float around in. 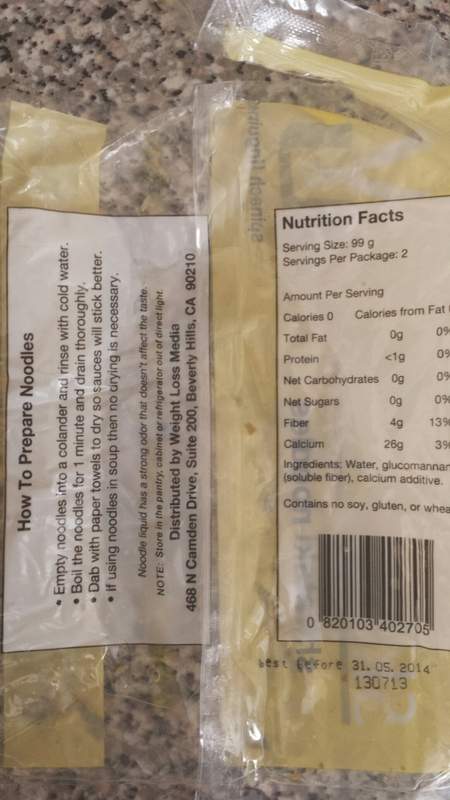 First impression after removing it from the bag: still just as smelly as every other shiritaki noodle I’ve had, but they seem a little more dense and feel a bit more like fresh, homemade pasta and not like slimy worms. Preparation is easy. First, rinse them thoroughly with cold water. This helps get rid of the smell. Then, boil them for one minute. The fresh pasta impression was even greater then. Drain, pat them dry with paper towels, and serve. The taste is bland. Really, they taste like nothing. Texture-wise, they are a little rubbery and chewy. Kinda reminded me of tofu, which I normally hate. I didn’t mind so much with these noodles. Each bag is 2 servings, which I didn’t know when I started eating. No matter, they are incredibly filling, which I assume is because of the fiber. I ate half and was satisfied. Looking at the nutritional info, you’ll see that they are low carb, fat free, gluten free, etc. 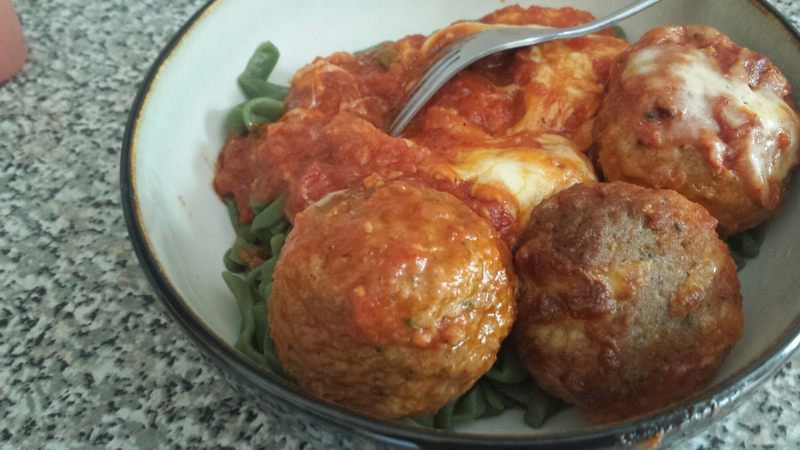 A good pasta substitute overall. Give them a try.